Oh, why not - right? Hi everyone! 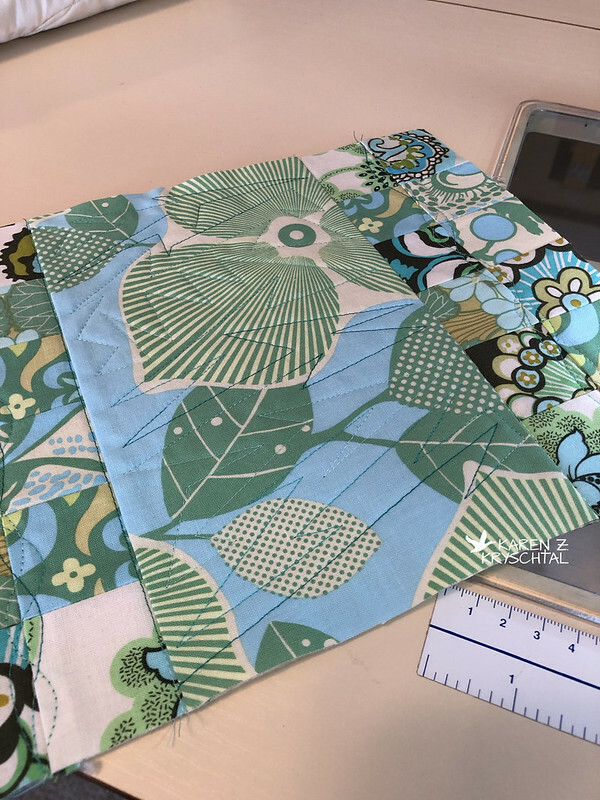 As I think I've mentioned, I'm trying to do two things right now: use up scraps and/or finish old projects AND improve my free-motion quilting skills. ...or lacking thereof. 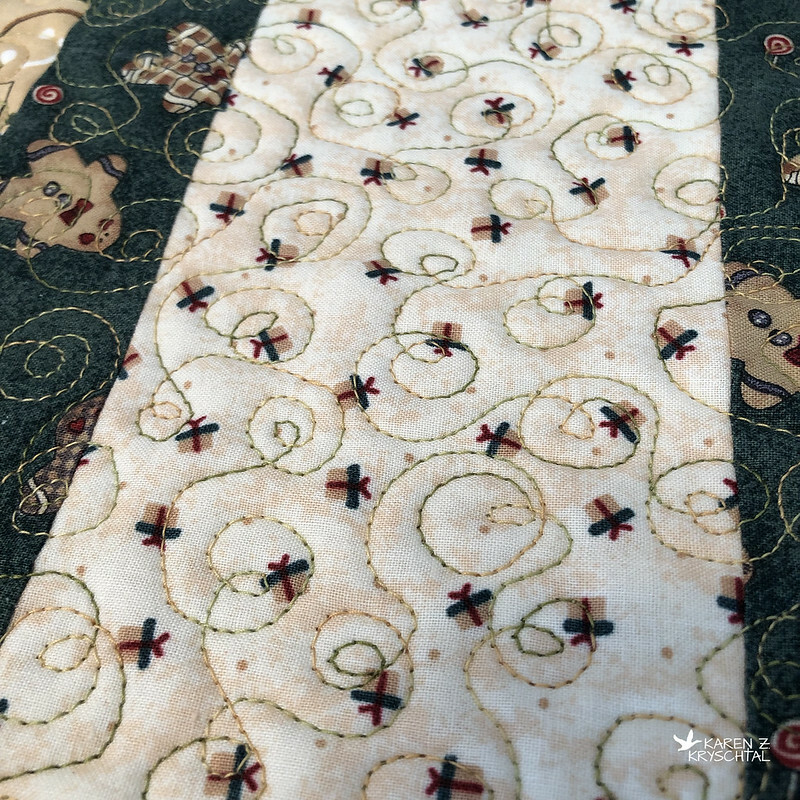 I've been sandwiching together fabrics I probably shouldn't have in my stash to begin with - cheap fabrics, fabs that might not be 100% cotton, and overall "what was I thinking" pieces - and have been practicing my free-motion quilting on them. 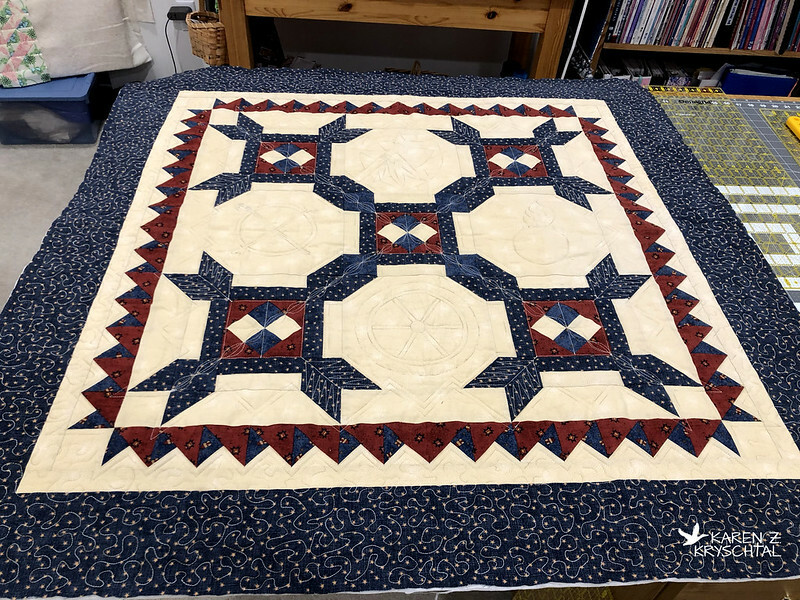 It's been very good practice, and there is no fear of messing up a project I spent who knows how long piecing. Ooh! 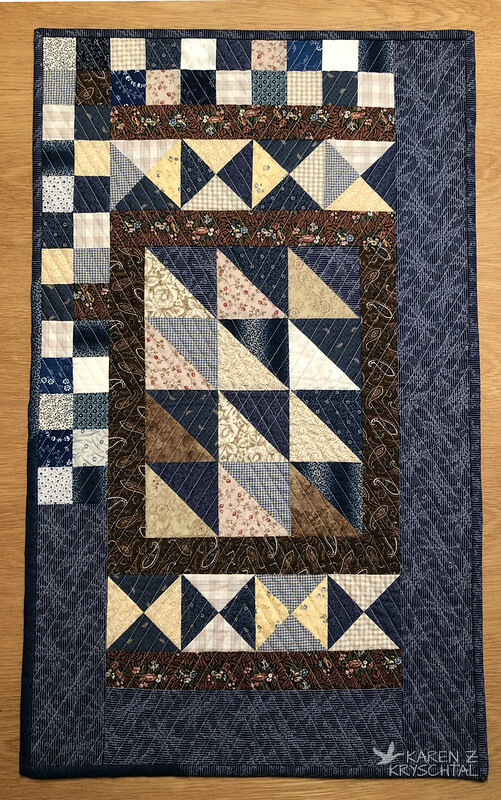 I started to pieced this string-style quilt ... I'm not sure when. 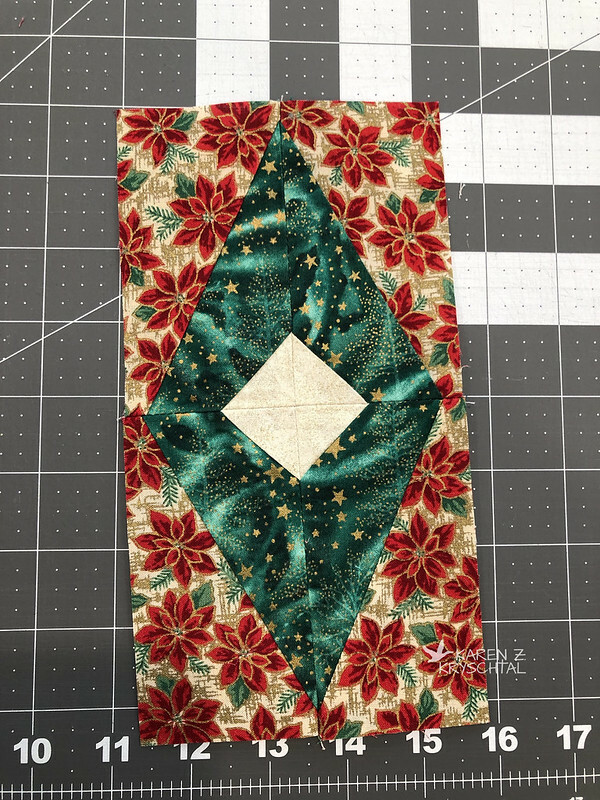 I thought now that I'm feeling a bit more confident with my quilting, this would make a cute table runner! And honestly, if I messed it up - it's just scraps anyway. Awesome! I went with the BSR (Bernina Stitch Regulator) and did a new-to-me design I'm calling Double Loops. Not too bad! I really like the design -- and of course the THREAD!!! King Tut Nile Crocodile. It's sages and golds, according to Superior Threads' website. 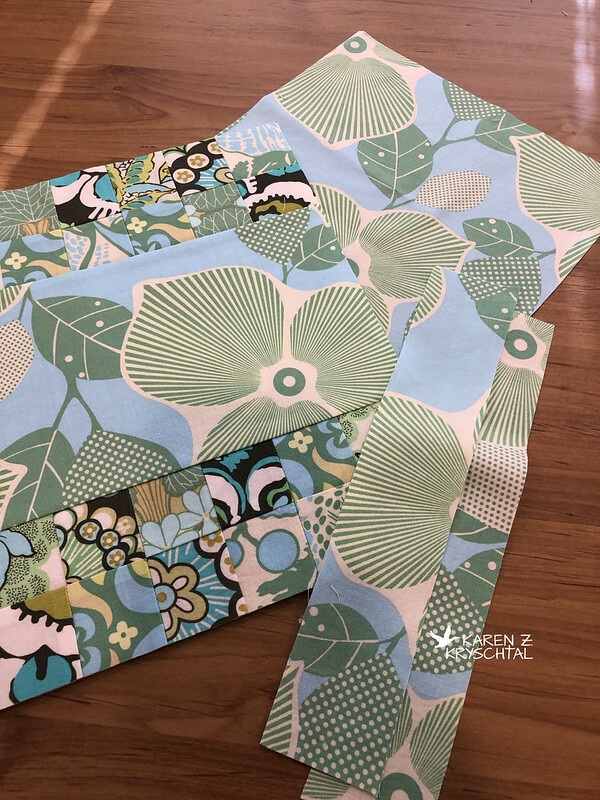 Not a color area I am comfortable in, but it really seemed to work with all the different fabrics in the table runner! I'm currently sewing the binding on - more pix when I'm done! Thanks for reading! Stay tuned for diamond-a-palooza! Ever since a friend mentioned the theme to The Partridge Family, it's all I "hear" when I look at these blocks now. ANYWAY, remember the Surfing Bird? He's had a few friends join him. I'm not sure what kind of bird it is. Large, thick bill, long legs, sort of thick body. Almost like a Dowitcher, only very colorful. I'm entertaining suggestions for names. That's the current line up. I'm doing these sporadically, just to play with scraps and to amuse myself. Lots more to catch you up on - I hope to post more again this weekend! Hi everyone! Let's join Mr. Peabody and Sherman and step into the Wayback (WABAC) Machine once again! I'm still trying to not start TOO many new things and work through my huge pile of unfinished projects. I pieced this one when we lived in Korea, 1994-96. As I understood it, the name of the block I started with (there are 5 interlocking blocks) was called Coxie's Camp -- and also Casey's Camp. At the time, my husband was a brigade commander in the Second Infantry Division (2ID) and was stationed and living at Camp Casey! (I lived in Seoul, on Yongson Army Garrison; spouses were not authorized to live "up north" at the camps.) I thought it was a cool coincidence - Casey's Camp/Camp Casey - so I had to make it into a quilt somehow. 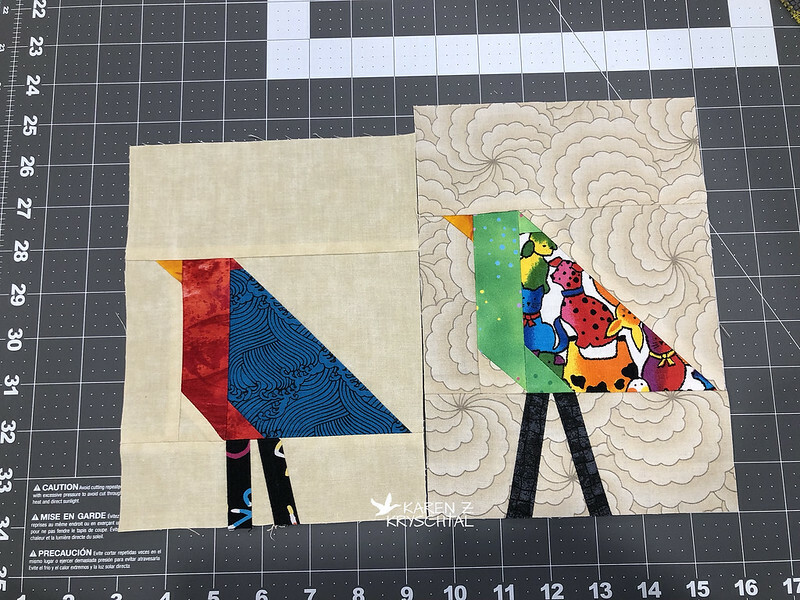 The pieced border represents the mountains around Tongduchon (or Dongducheon), the town outside Camp Casey's gates. I had drawn a design in the 4 large buff-colored spaces - taking artistic license with the 2ID unit crest and the 2ID patch. 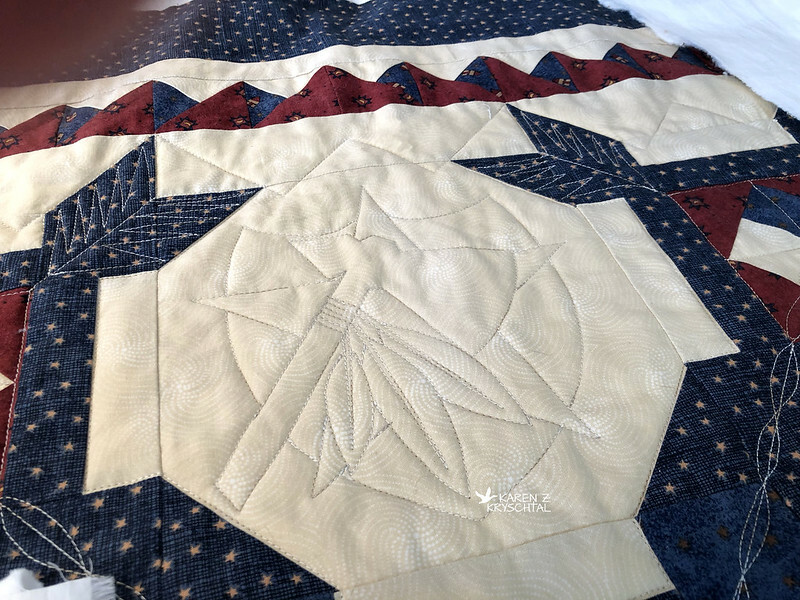 At the time, I was a hand-quilter and thought it would be relatively easy to quilt them. Well ... yeah. 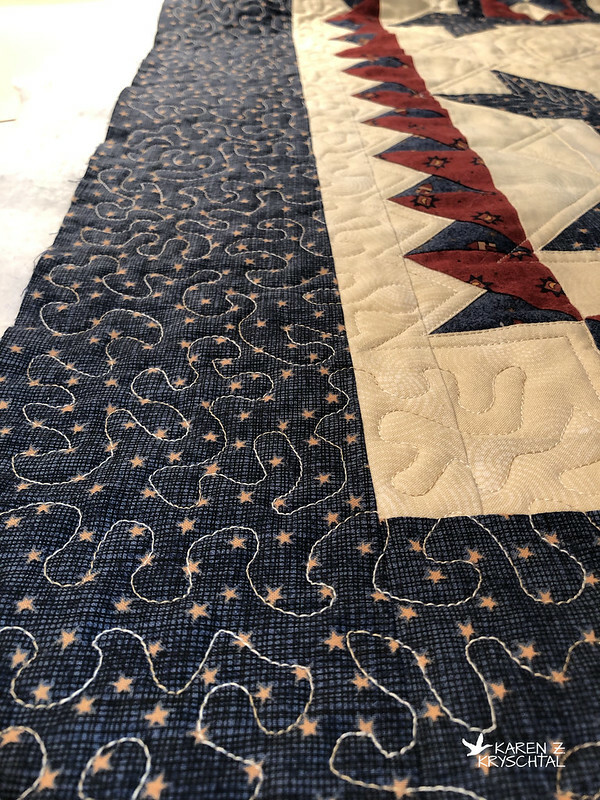 But I don't really hand quilt much at all any more, so that ship has sailed. Anyway, for whatever reason, that quilt was put aside. 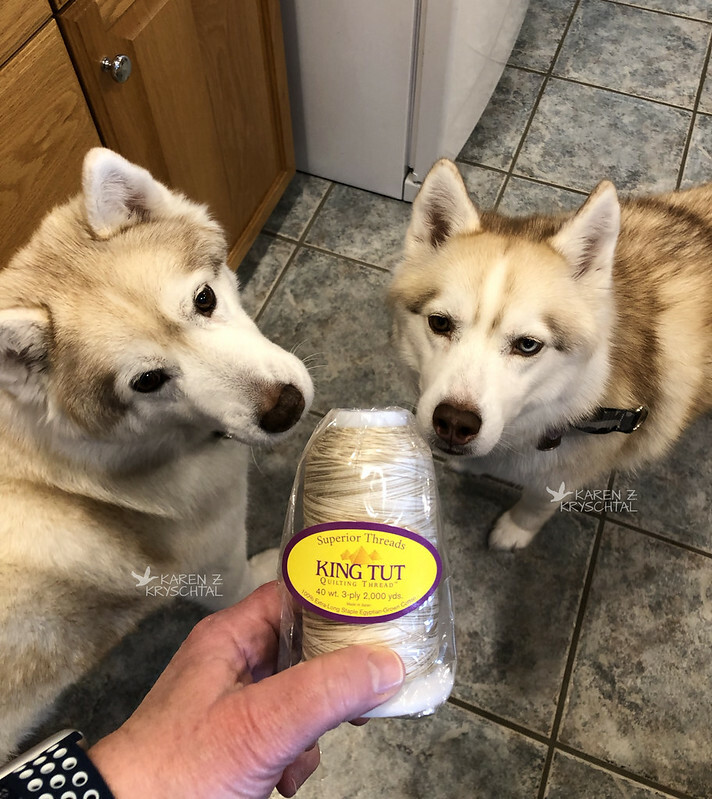 I really thought it was time - but first --- I needed thread! Of course, I turned to the King!!! The girls like it! It even matches their fur! Sands of Time. I've used it before and LOVE all the medium creams. I thought it would be perfect! And now that I have a super-duper cone holder, I could get a BIG one! I started with some of the straight areas, started doing some twisted ropes, then forced myself to tackle that crest/patch I had designed. Really not too bad - especially since I did it with my walking foot! BUT, and this was the kicker, I wasn't going to do it four times. No way, no how. I put on my thinking cap and kept going. You can see my cone holder there. I love it! You can more or less see my versions of the crests - oversimplified, but they get the message across. I'll do closeups later; right now, you can still see the pencil marks from my original 2ID crest/patch composite. Very messy. That will wash out. I hope. Please. That actually went fairly well. I thought the meandering looked reminiscent of camouflage, so it fit the whole theme! On to the binding! I had a slight hiccup there, as I appear to have made an apron out of the fabric I was going to use for the binding. Oops. No problem. I had a little left, then added some of the other blues and the red. The houses on the blue fabric are just about the color of the house I lived in on Yongson; I thought that was kind of funny. 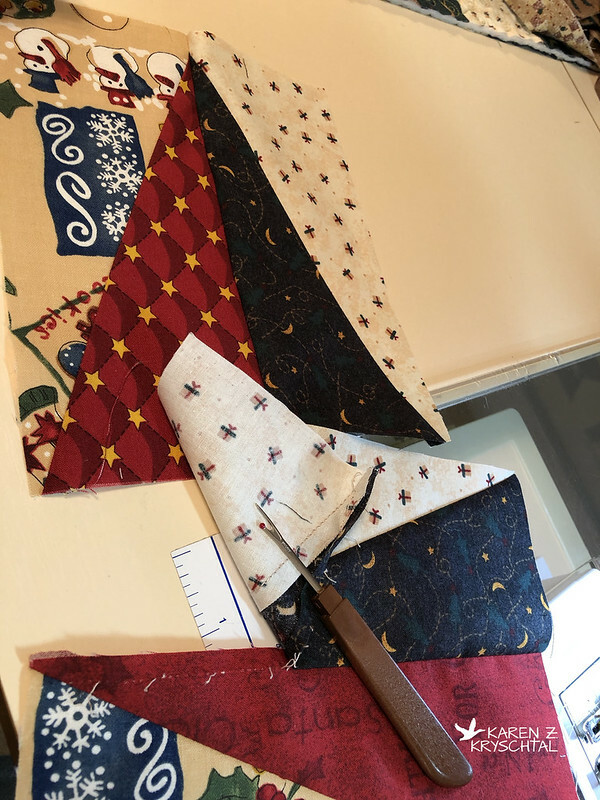 I'm doing the hand-sewing on the binding now; I'll post a shot or two when I'm done. It feels so good to go back and finish these things! Hi everyone! I've got several irons in the fire, as I like to do. 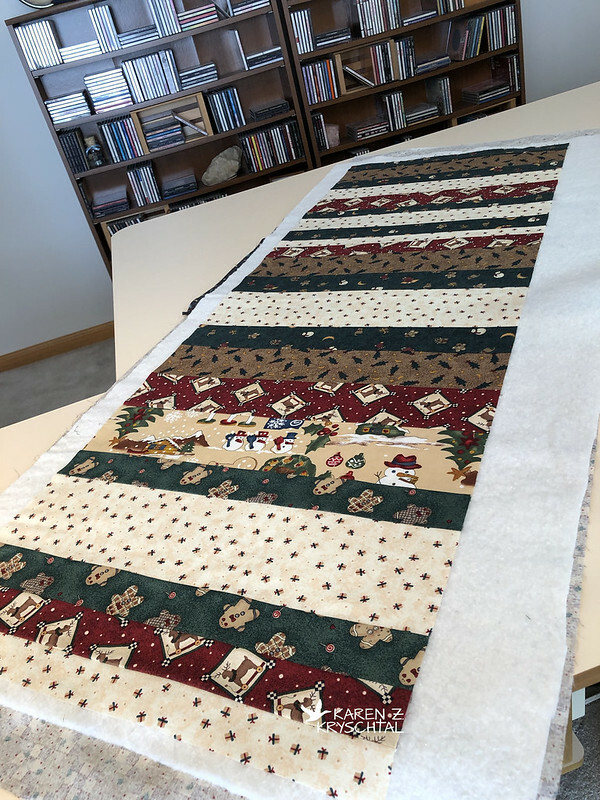 Les Pensées de Grandma, the Scrappy Not Really A Jelly Roll quilt, the Kansas Dugout quilt are all in line to be quilted. 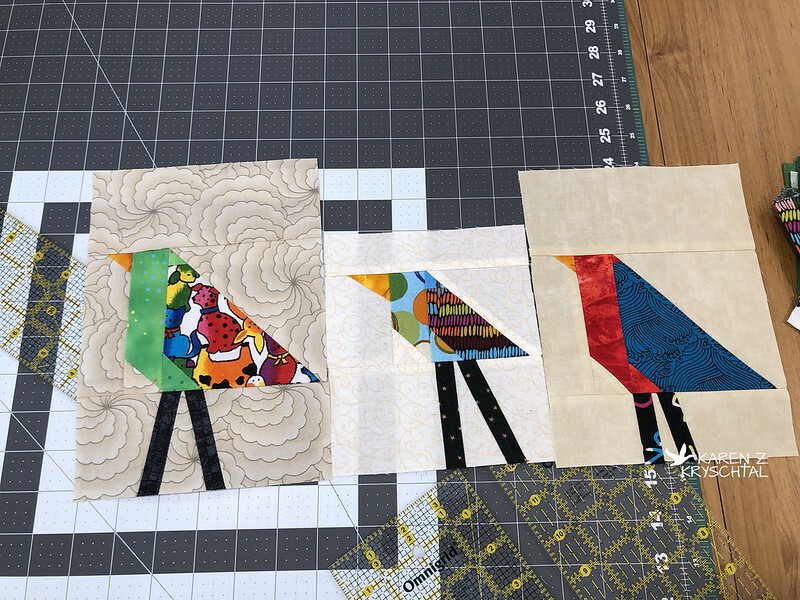 I'm still thinking on the leftover HSTs project. I also need to make some new leashes for my girls. That being said, what have I been doing? HA - starting to quilt a large wall-hanging I pieced somewhere between 94-96 when I lived in Korea AND started a new project just for fun. No, this time it's a quick and easy one - just a little basket for a friend. (I used this tutorial; it's one of my favorites!). 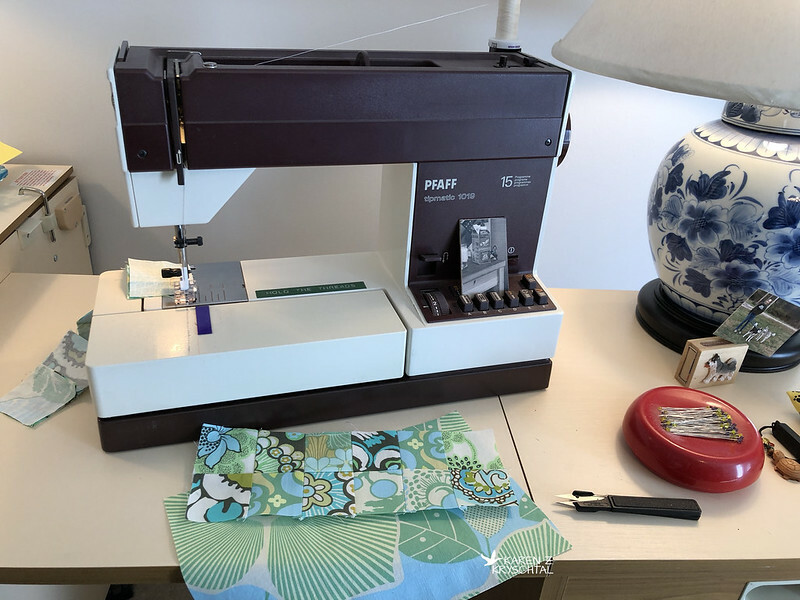 I already had loaded some quilting thread into my Bernina to do some practicing, so I thought I'd piece the basket on my trusty, old Pfaff! It's very basic, but still purrs like a kitten! It was really fun using it! 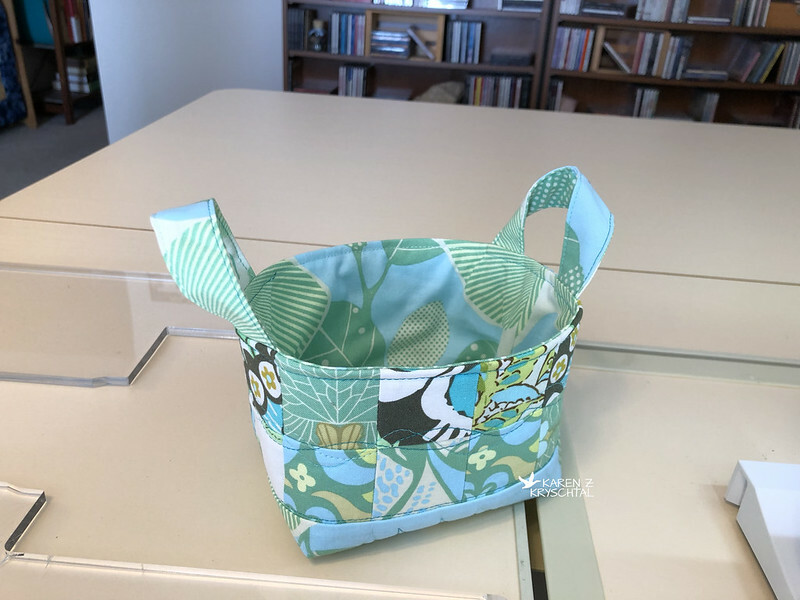 The basket is just a sweet, small one, made from scraps from my X Plus quilt. 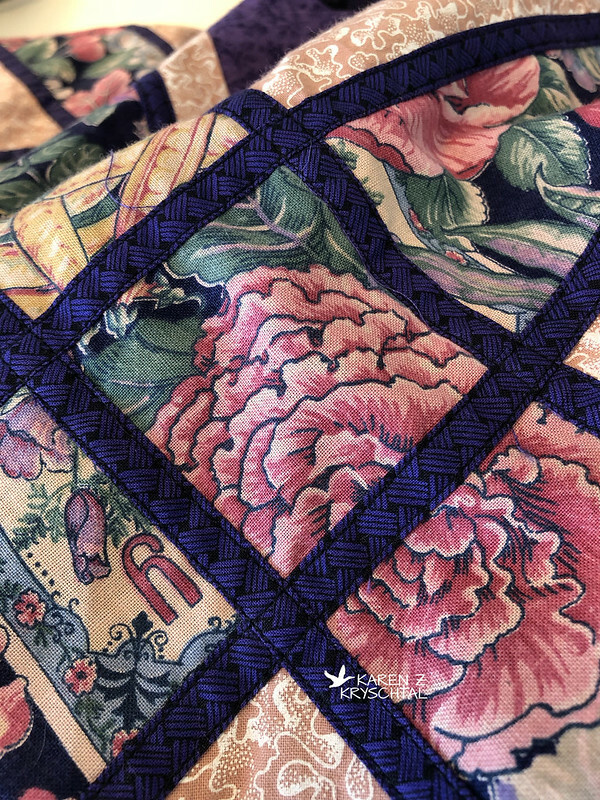 I just love the colors and the fabric is a delight to work with! Isn't that fun? 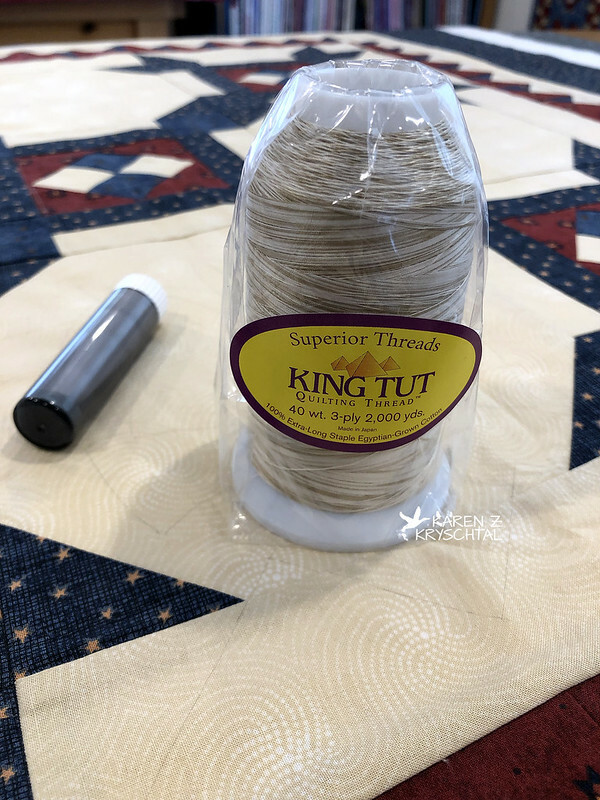 That is the same Aurifil thread I used for my quilt. It's right up there with King Tut. I love how the basket came out. These are so fun to put together; I hope my friend likes it as much as I liked making it! I've been working on several different things lately. 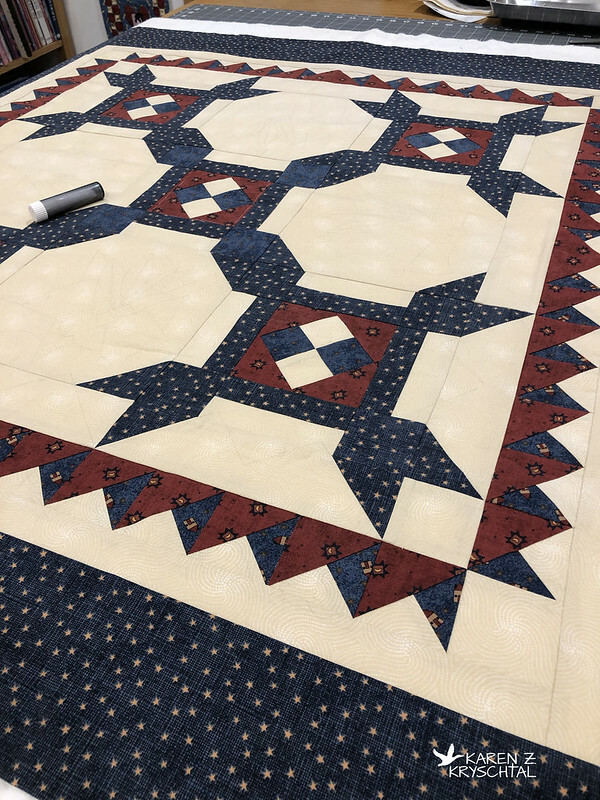 One major accomplishment was getting the lattice sewn down on the Les Pensées de Grandma quilt. 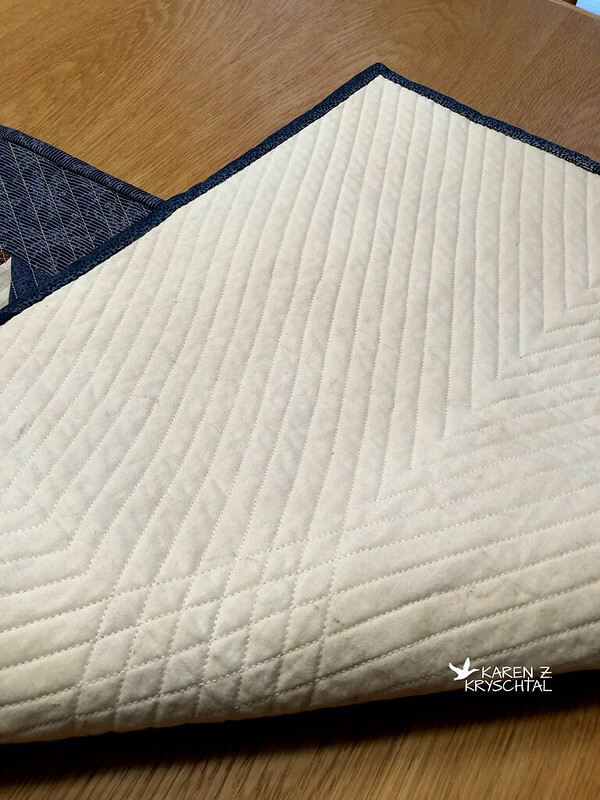 As I explained in my last post, now that I hand-sewed the lattice where the fabric had frayed, I felt confident to machine stitch over that -- topstitching along both sides of the lattice. Just to make it all even. It would take even longer by hand. If I hadn't used cheap fabric, I wouldn't have this problem. I mean creative challenge. Before I could silently complain too much, I was done! I'm pleased with how it looks, and actually think it's a nice touch. I just hope it holds, you know? Hi, everyone! 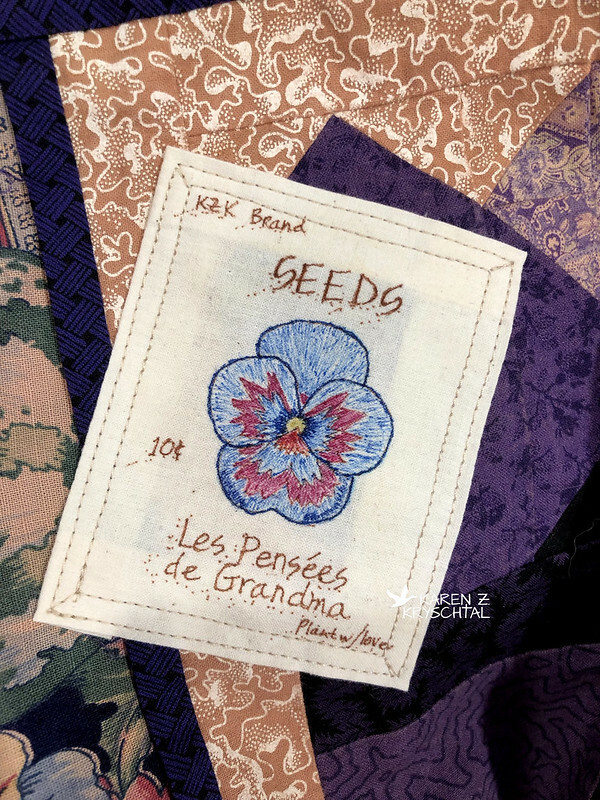 I'm still chugging along on Les Pensées de Grandma. I've now got both sides of the lattice work sewn down where the fabrics have frayed. So ... not the whole lattice structure, but on the rather "delicate" areas. Now, I feel confident to run my Bernina over the entire lattice and stitch it all down by machine. That's where I am with that. No photos of it yet; I forgot to take my iPhone downstairs while I was working on it yesterday. I'm really pleased with how it came out. Now that I've had even more time to think about it, I have a feeling I started it in the late 90s. My straight lines got better as I went along! Sometimes it just takes me a while to relax and get the feel of things. 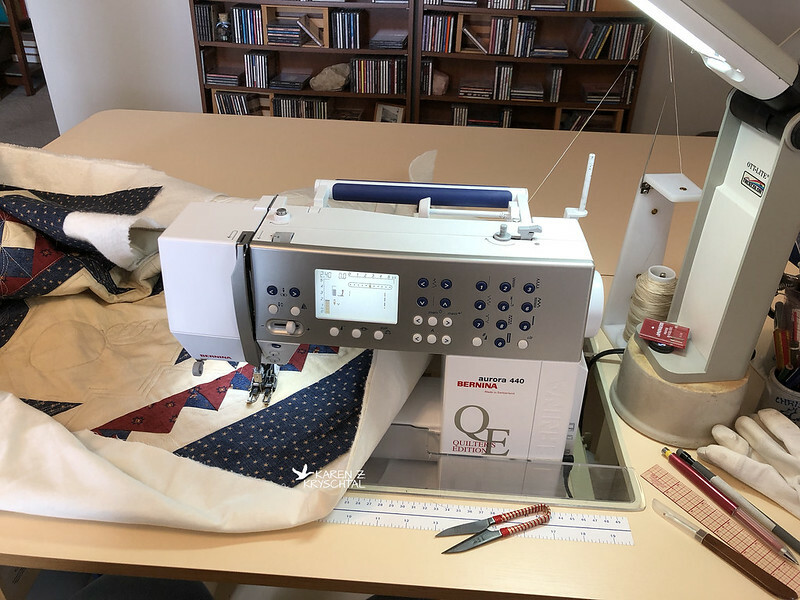 I've been watching all these videos of "ruler work" - using a thick ruler to guide your presser foot as you machine quilt. 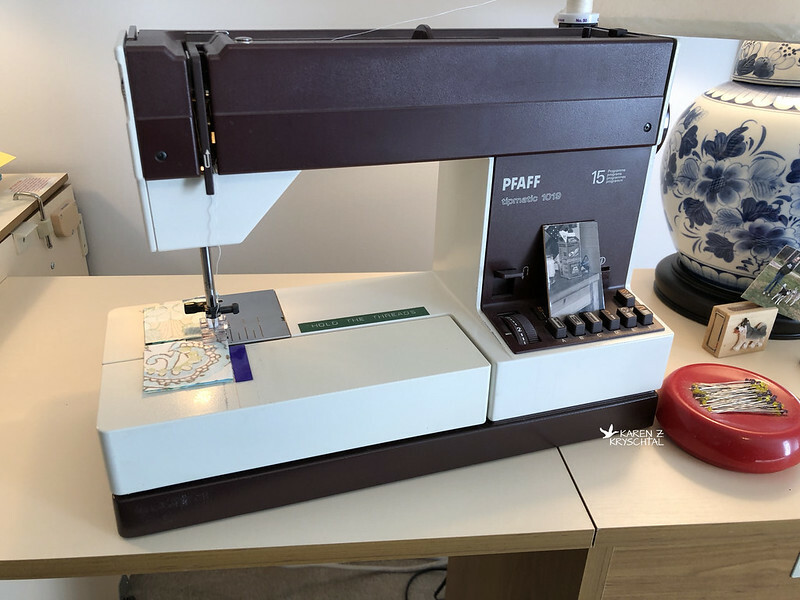 I was totally intrigued - until I saw how expensive the foot for the Bernina is. I mean, seriously? $80-90 for a FOOT?!? 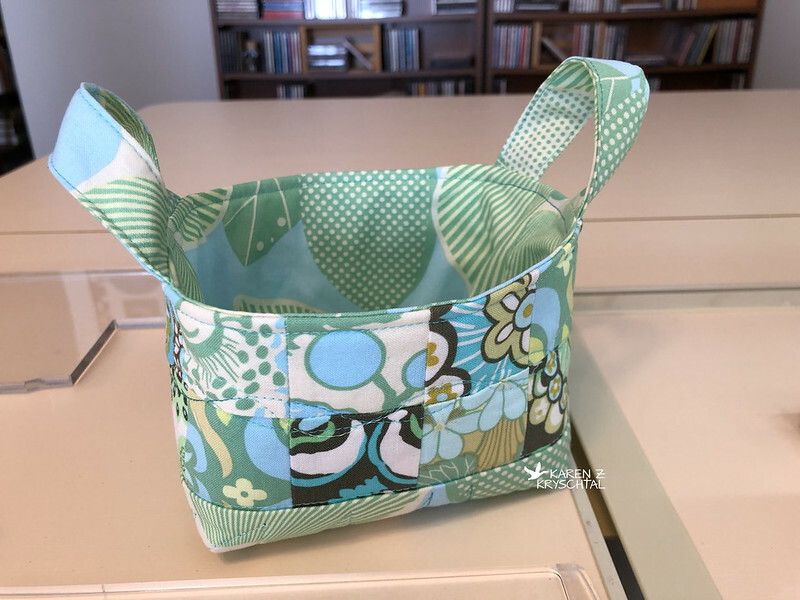 I put it on the mental back burner ... then my friend Pam in South Africa showed me a big Bernina sale coupon! 25% off at participating shops! AWESOME! 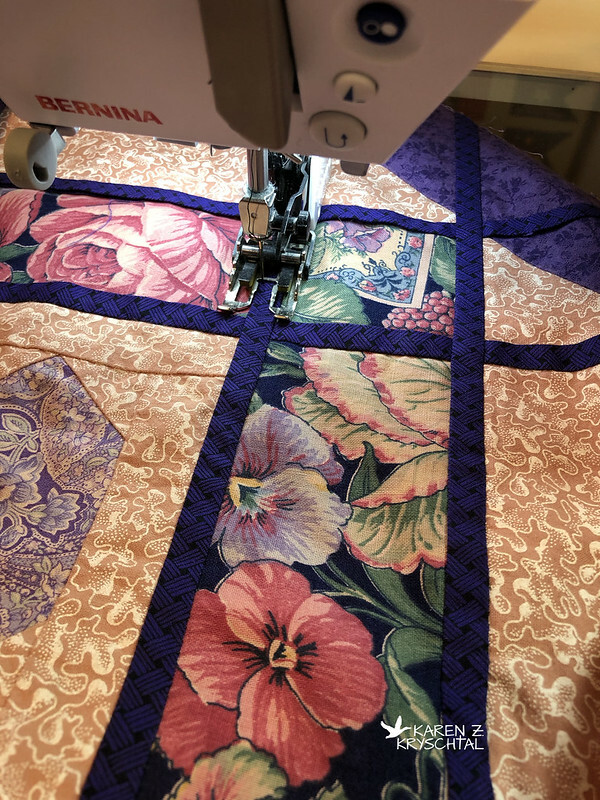 I flew out to the nearest Bernina shop, came home with their only #72 foot, and started trying to see what I could do. Oh. I did NOT like any of the over-priced rulers they had, so I primed the ones I wanted from Amazon. 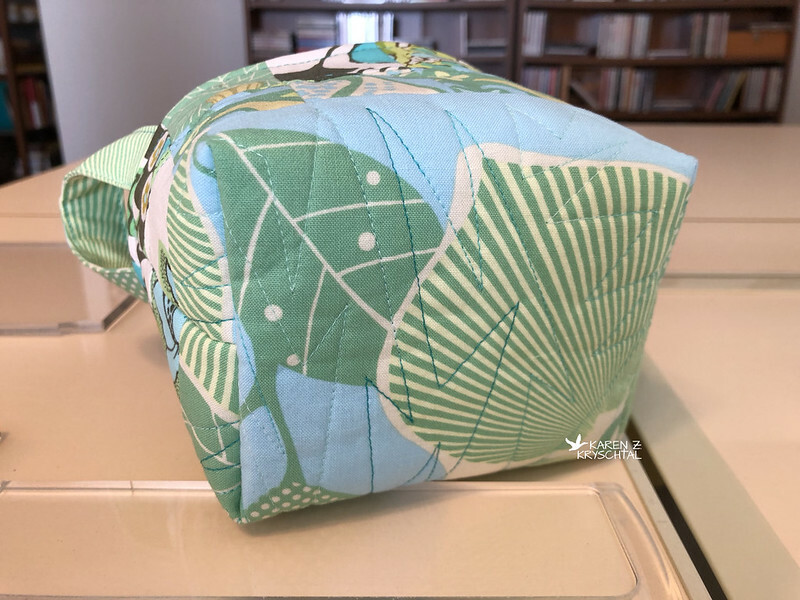 I discovered I stink at true free-motion quilting. I only semi-stink with the BSR (Bernina Stitch Regulator), but you can't REALLY use that with the rulers. You sort of can ... but you can't. Anyway, what I found after much practice was that if I get my feel, my rhythm, with the BSR first, then switch over to the 72 foot, I'm not terrible. And if I look closely at the work shown on some of the vids I've watched ... I'm REALLY not bad. At least on small, practice things. So - I've been working on that. Just doodling. Switching between the BSR and the 72. It's kind of fun! Not perfect, but I think once I hit it with some tea to subdue it a bit, it will look like it belongs there! 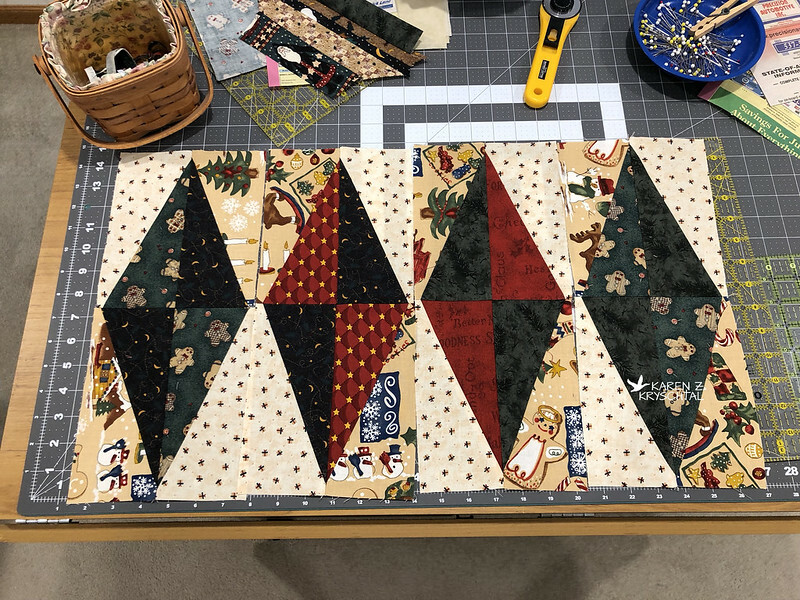 Today I hope to get more of the lattice done, then think about a backing!